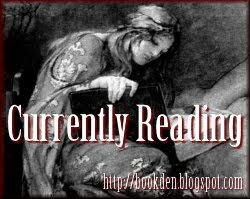 Would you like to participate in Currently Reading? Click here for details. I'm about half way through Southern Gods, and it is really surprising me. I try not to find out too much about a book before I read it because I'm spoilerphobic, but I'm pretty sure I had no reason to expect the events that are currently taking place. I'm loving it. Jonathan Maberry stopped by last week to guest post. Check it out if you haven't! I couldn't help but start reading Dead of Night, and so far I'm really diggin' it. Grace at Feeding My Book Addiction is having another read-along this month. In honor of Valentine's Day, she chose horror as the genre of the month. You see why I love Grace, dontcha? Tomorrow is the first read-along post, but it lasts all month if you want to jump in! If you've read Feed already, come back tomorrow and share your thoughts! What are you currently reading this week?